Do you have questions on How to Plan your Company Picnic or Employee Picnic? Planning the entire event requires many steps to organize such an event that will meet everyone’s expectations; but, you can do it all without breaking a sweat. 1) Plan Ahead– Number of Guests, Budget, Location, Date and Time, Atmosphere, Food, Entertainment. 2) Make a List of Tasks– Who is to complete them, and by what Time. 3) Professional Coordinators / Planners– Save time and money with their experience and ability to handle all the negotiations. Ask for a Quote. 4) Check references– Making sure the coordinator can handle your expectations. 5) Ask Questions to your Coordinator (Planner)– How many events have you produced, what kind, for how many. 6) Review the Venue with your Coordinator / Planner- Before the event is to take place (parking, traffic flow within the picnic area, trash detail, seated areas). 7) Have all agreed-upon details written into the Contract. Start planning a couple of months ahead, if even a year before the event, especially for 25th, 50th, and 100th anniversary picnics. Make an agenda of things you would like to have at your company picnic. Planning ahead makes sure you get the entertainment equipment, the location (local parks may require registration or the company property may need to be cleaned), the date that is convenient for the employees, upper management and their families. Planning ahead will most likely save the company money by booking early. Knowing the number of guest you wish to attend will help you decide all the variety of food and entertainment needed for the company picnic. Ask yourself these questions: will the event be for employees only, employees and immediate family only, employees and friends (aunts, uncles, cousins, family friends), does your company have employees that work in shifts and the company is working 365 days a year (how will everyone enjoy the picnic…having your company run 24/7 is not a problem, it will just need to be thought-out prior to the company picnic…maybe you take a meal to those working during the picnic…maybe those on shift can come during their lunch time or have 2 hours of play time during their shift). Having a company picnic on company grounds could let family members or locals see the work environment and history of the company with a tour of the plant. Figuring out who is coming to the event helps you tackle the types of entertainment and food items that will be most influential. What type of guest will attend the event: young children, teens, adults, grandparents? Getting the right location is critical to make sure all guests will be able to attend. Here are some suggestions when selecting a Facility for your event. 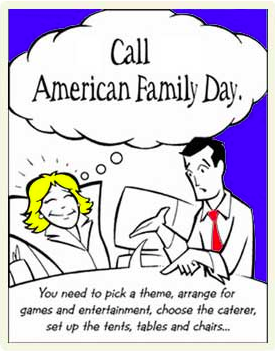 American Family Day will be happy to assist you with any of these details. American Family Day wants to ensure that every detail of your company picnic has been thought out, from start to finish. As a skilled event coordinator- We can plan budgets with creative ideas to suit your needs; along with, supplying all necessary items (from audio/visual to arranging decorations to hiring portable restrooms) for the event. From all-day, all-you-can-eat catering, to giant inflatables and midway games, American Family Day provides the most complete event services possible. By putting “Contact AFD” at the top of your agenda list, you will relieve the strain from your shoulders of planning your company picnic. American Family Day serves over 300 clients each year, providing corporate events all across the continental United States. Each year there are over a quarter of a million guests at our parties. So, you can rest easy, knowing that American Family Day knows our business and how to get it done.